The Albany Business Review has announced that Teal, Becker & Chiaramonte, CPAs, P.C. 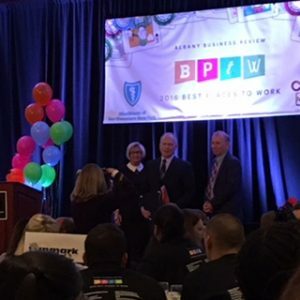 (TBC) has been named to the 2016 Best Places to Work list. TBC, the largest CPA firm in the Capital Region, has now received this award five times in recent years. This award recognizes achievements in creating a positive work environment that attracts and retains employees through a combination of benefits, working conditions and company culture. TBC is a recipient of the award in the Top Medium-Large size companies, which have between 50 and 149 employees. This is a highly competitive honor, with over 100 companies being nominated for the award and only 36 being selected across all categories. The companies selected were chosen based on data collected through a confidential employee survey conducted about the company. “This award is a great way to end the year, in which we have made many successes and have celebrated 45 years in business,” said Managing Partner Jim Drislane. “TBC is an amazing company for many reasons, but at the top of my list is their commitment to giving back to the community and generosity in doing so,” said Tax Supervisor Tina Suhocki. Suhocki has nominated several charities for the employees’ dress down Friday donations throughout her 13 years of employment at TBC. Year in and year out, the Firm is involved with helping a number of not-for-profit organizations, however during the summer months, the shareholders and employees pledged to celebrate TBC’s 45th year in business by completing 45 Acts of Kindness. From volunteering at places like the local food bank, to kids carnivals, to cooking a meal for homeless people and making surprise visits to organizations with donations of goods or money, the Firm completed its mission and made a lot of people happy along the way. Read more about the initiative on the TBC blog. Within the accounting industry and across all fields of work, TBC boasts a particularly high staff retention rate with little to no turnover. Of the Firm’s 80 plus employees, 28 associates have been with TBC for 15 years or longer. The Firm credits much of its success in retaining quality clients and attracting new prospective clients to the dedication, commitment, and longevity of its employees. Aside from its strong community support, the Firm regularly hosts employee outings, promotes wellness initiatives, and has a year round commitment to work-life balance. This December the Firm will host it’s a lunch and learn on understanding the risks of cancer with an outside speaker from the local American Cancer Society. The focus on professional development is of upmost importance. Employees are supported for the CPA Exam as well as other professional designations. There are also opportunities to further industry knowledge within the firm, through Continuing Professional Education (CPE) courses and conferences, on both a local and national level. For additional information about working at TBC, check out the Firm’s current openings.